What’s especially interesting is that GivingTuesday uses this tag line: Help others through the gift of your time, donations, goods or your voice. Five years ago, the 92 Street Y in NYC and the United Nations Foundation wondered how they could bring back the spirit of giving to the holiday season and cut through all the extra noise. So they created GivingTuesday, a one-day annual movement focused just on charitable giving. In its fourth year, GivingTuesday saw the biggest increase in donations yet, growing from $45.6 million in online donations in 2014 to a whopping $116.4 million in 2015…. No one reading this Hot Topic will be surprised in the least that yet another campaign about philanthropic giving emphasizes donated money over donated time. And, since both Black Friday and Cyber Monday are commercial shopping events, it’s logical to piggyback a different way to spend money as the “hook” of GivingTuesday. Quite clever, really. Check whether your organization’s development office is already planning fundraising outreach on November 29. If so, propose that they add messages about volunteer opportunities to their messages, too. Maybe together you can review the CauseVox information on how to run a #GivingTuesday campaign. There’s a free guide you can download, too. November 29th is #GivingTuesday. After you’ve eaten turkey and shopped for holiday gifts, express your philanthropic side! Give the gift of your time to make a difference in……. Join forces with other volunteer resources managers and staff a booth in the local shopping center/mall advertising volunteer opportunities. The sentiment above should resonate well there. Just be sure that your signage uses the #GivingTuesday branding so that you connect this booth to an international event. That way you can catch the attention of anyone who has seen mention of the campaign in other places. All of this is an example of one of the most important tools available to recruiters of volunteers: piggybacking. 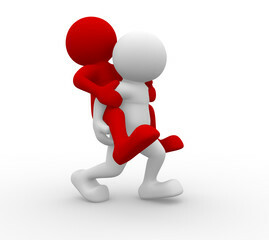 To be sure I’m communicating to everyone, piggybacking is defined as jumping on someone’s back and letting that person carry you to a destination. In this context, it means identifying an event, activity, or campaign being run by some other organization, business, or sponsor on which you can capitalize. You make use of the existing newsworthiness of the event to focus attention on your cause or campaign, too. The idea is to attract people to you with less effort because others have put the energy and resources into gathering like-minded individuals. Note this is not competition nor in any way unfair practice. In fact, your piggybacking activities back the pre-existing event. That’s what the ideas in the previous section were all about. It’s win-win. But there are so many opportunities all the time to piggyback. Mainly it requires keeping your eyes open and using your imagination. You are trying to find a “hook” with which you can turn someone’s attention to an event towards your volunteer needs. Here are a few ideas to spark your thinking, whether or not you would want to pursue the possible activity. Can’t stand the news right now? (Or, “refuse to answer your phone to avoid another political robo-call?”) We can promise you a few blessedly television- and telephone-free hours whenever you spend some time [visiting with our residents…helping our students with their homework,,,quietly shelving books…]. The pictures on the news are frightening our [residents/students/ families….]. How about you? Let’s laugh instead! We need volunteers to participate in “fun hours” – read a funny book to a child [show old funny movies and give out popcorn to our residents….]…. Supporting the Cubs? Our young students are cubs, too! Support them as a mentor…. Do you know what you can be a part of just across the street? Love food? So do our seniors. Join our lunch-with-a-friend program. You can’t invite someone to volunteer if you don’t get their attention first. Refine your skills in the art of piggybacking and you’ll get your message across much more effectively. With less work on your part and a fighting chance to communicate with people who are predisposed to want to learn what you do. I’d love to hear how you have practiced piggybacking as a recruitment tool. Please share your stories below! Meanwhile, happy GivingTuesday! Great info. Would like to receive more. Thanks for the very relevant information always! Hildy Gottlieb of Creating the Future has a great commentary on Giving Tuesday that offers yet another perspective on how to make the most of the day: "The Real Potential of Giving Tuesday." See what you think. Love your articles, Susan! Thank you! And thank you for posting, Stephen!